You can find all the landing pages you’ve created in your account dashboard under the Lead Pages tab. Here’s an overview of what you can do to manage and edit pages in your account. Click Last Updated to sort your pages to suit your needs (such as by name or by creation date). You can also search for any page by clicking search at the top of the list. Some of you may have assets built with our legacy builder, the Standard Builder, therefore you'll see a mix of blue and green icon colors. Our Drag & Drop Builder is our flagship builder with the most customization and biggest feature set. To edit any page, click its name. Or, click edit to the right of your page’s name. You can also change your page’s name, access publishing options, and publish a Facebook ad from the action menu more to the right of your page. NOTE: To edit a split test, click setup which will bring you into the split test editor. As your list of pages grows, there are a few things you can do to keep things manageable. Split tests appear alongside regular landing pages in your account. To identify a split test, look for the split test icon (shown below). Each split test will also have a label to indicate its status (draft, running, or ended). 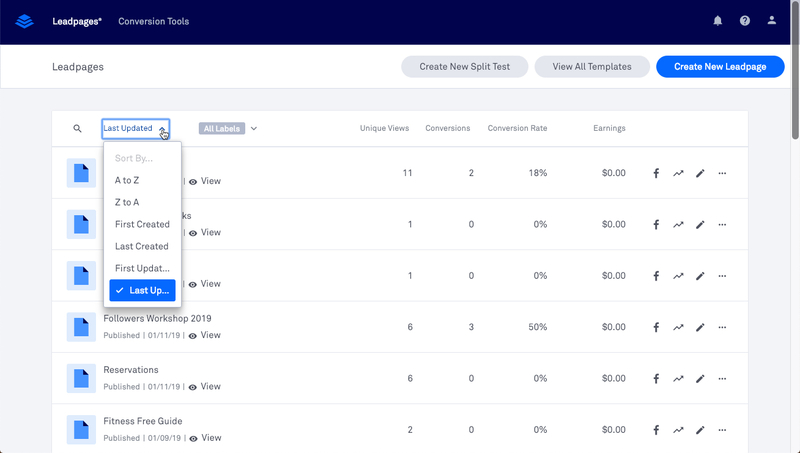 Keep in mind, not all page options are available for split test, such as creating a Facebook ad. First, we recommend giving each page a descriptive name, so you can easily remember what each one is called and search for them later. You may even consider appending a suffix to the end of each page in a given campaign (although you can also use labels for this purpose). It’s possible to rename a page at any point. To do so, click the action menu more for the page you’d like to edit, then select Rename. Keep in mind, you can change the title of any page manually so that visitors won’t see the name you’ve chosen. Each page can have one color-coded label. To add a label, hover over a page and click + Label. Choose a color to assign the label to your page—you can name labels by clicking edit next to any color. ​Click All Labels at the top of your page list to choose any of your labels. When you select one, you’ll only see pages with that label. Besides your pages’ names and labels, you can get extra information just by scanning your list. The icon before each page denotes whether that page uses a Standard or Drag & Drop template (you’ll also find this information under page names). Under each page name, you’ll also find its publish date (or an indicator that the page is still in draft mode). To the right, you’ll get a quick overview of your page’s analytics, including: your total unique visitors, total opt-ins, conversion rate, and earnings. You can get to any page’s full analytics by clicking the chart icon analytics next to the edit button. TIP:For opt-in pages, you’ll also see an inline chart showcasing your conversion rate for the past 7 days.